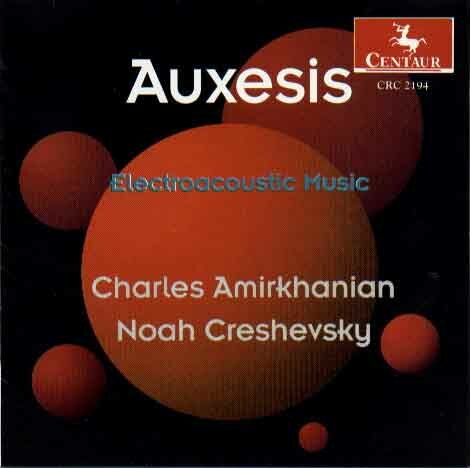 Noah Creshevsky, horn in 1945 in Rochester, New York, began musical study at age flee at the Eastman School of Music. He graduatcd from the State University of New York at Buffalo, where he was a pupil of Virgil Thomson, and studied with Nadia Boulanger in Paris and Fontainebleau. His master�s degree is from the Juilliard School, where he was a pupil of Luciano Berio. Borrowed Time is composed of fragments of vocal music dating from the twelfth to the twentieth centuries. Each sample consists of a solitary musical event, the duration of which is always shorter than one second. Melodies, phrases, and harmonic progressions were generated by arranging and rearranging tiny hits of embryonic musical matter. Allusions to Middle Eastern, Asian, and Western sacred and secular music (including opera) seek to integrate a vast spectrLlm of sources to form a unified musical fabric. Nearly all of Borrowed Time is a cappella, and every second of it is of human origin. Borrowed Time was composed in 1992. It is dedicated to the memory of John Cage. Private Lives is a suite of contrasting movements which follow one another but do not deliberately interact. Some of its movements are binary, and a few are musical portraits. Subjects include the scholars and musicologists H. Wiley Hitchcock and Sherman Van Solkema, the dancer Doris Rudko, and a self-portrait. The music which delights me most is that which best conceals its techniques. A resonant childhood memory is the thrill of witnessing a magic trick without having a hint of the maneuver behind the illusion. Alas, the spell dissolves into something common when an earthbound process is unmasked for the pedestrian thing it is. Stravinsky was able to compose movements which follow each other without any apparent reason except that they are there. In Private Lives--and in many of my other compositions--I set Out to link a succession of disparate moments into something that is whole. Private Lives was composed between October 1992 and April 1993. It is dedicated to H. Wiley Hitchcock. Coup d�etat begins with such giddiness that it might be music for a dinner party gone berserk. Until the solemn ending, all its sections are in states of perpetual ascent. This musical uprising is the joyous insurrection of a composer absolved of responsibility for anything terribly important. As does all music, Coup d�etat celebrates the harmless innocence of sound. And like so much other mtisic, writing, painting, and embroidery, it absurdly seeks to be more than such pursuits can ever he. Coup d�etat was composed in 1993 and 1994. It is dedicated to Glenn Snell.